“pure water” is a highly effective cleaning solution eliminating the need for detergents and chemicals. The absence of sticky soap residue means that dirt will find it harder to cling to your windows and your windows stay cleaner longer. 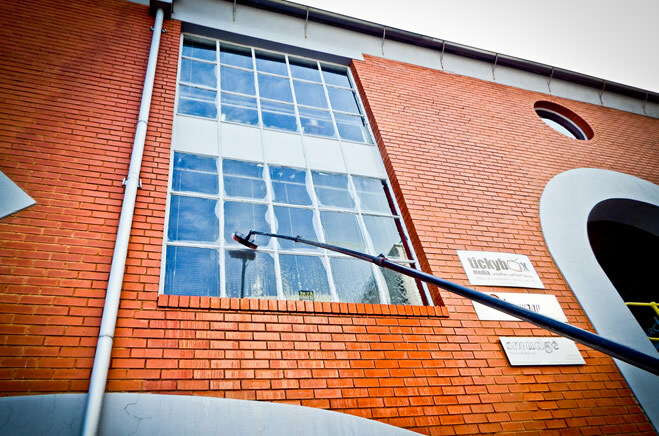 Our system will brush your windows clean, firstly loosening the dirt and then secondly, rinse and flush away the dirt. We then leave them wet and allow to dry naturally leaving no marks or residues. We can now reach previously inaccessible aspects of your property safely and effectively. Second and Third floors, all types of windows and frames, panelling, fascias, soffits, garage doors etc. no problem! No more dents in your lawn or your window cleaner peering through your upstairs windows. Ensuring your gutters are clear and clean is an important part of your home’s weatherproofing & waterproofing system. Debris such as leaves, grass and moss can collect in the gutters causing blockages. Gutters cleaned regularly are less likely to suffer costly problems, such as strain on brackets and damage to the actual gutter from wet and rotting debris. If gutters are not maintained adequately, water is unable to drain away from the property sufficiently. With the latest Gutter-vac technology we can now reach previously inaccessible aspects of your property safely and effectively. This system increases our efficiency, a benefit we pass on to you the customer, in the form of a competitive price and excellent service. We recommend a clean in Spring or Autumn, however, if your house is located where there are lots of trees more frequent cleaning may be required.